Art education. Professional training in the various forms of visual art and its supporting disciplines, including the theory and history of art. In Ukraine, as in other European countries, art education at first consisted of the master’s handing on his experience to his pupils. The first teachers of drawing and miniature painting in Ukraine were probably Bulgarian, and the first teachers of stone architecture, mosaic and fresco painting, icon painting, and wood carving were Greek. A few names of monks who specialized in the arts have been preserved. The iconographer and mosaicist Master Olimpii (d 1114) of Kyiv studied with masters in Constantinople (to 1084) and founded the Kyivan Cave Monastery Icon Painting Studio. The miniaturist Deacon Spyrydonii, who drew 300 miniatures in the Kyiv Psalter of 1397, was a member of the Kyiv school. The monk Petro Ratensky (d 1326), painter and architect, and eventually the metropolitan of all Rus’ (1308–26), belonged to the Galician-Volhynian school. In the 15th century the arts were studied within the Ukraine system of religious brotherhoods and guilds, which developed particularly rapidly in Galicia. The requirements for a master were raised: besides icon painting, a master had to know portraiture, multi-figured painting, battle painting, and genre painting and had to be acquainted with the artistic centers of other countries. Familiarity with the contributions of Western Europe had a positive influence on the artists of the Lviv and Zhovkva schools (see Zhovkva School of Artists), such as Ivan Rutkovych, M. Rutkevych, and Vasyl Petranovych and Mykola Petrakhnovych. By the end of the 16th century the students of brotherhood schools were being taught to draw and paint. During the 17th century and the first half of the 18th century the Kyivan Cave Monastery Icon Painting Studio was the artistic center of Ukraine. In the second half of the 18th century so-called supplementary classes in architecture and painting were set up at the Kharkiv College (directed by academician Ivan Sabluchok in 1768–73, and then by his students until 1798); the Kyivan Mohyla Academy (from 1784); the Nizhyn Lyceum (directed by K. Popov, 1820–39); Kyiv University (directed by the same K. Popov in 1839–46 and then by Havrylo Vasko until 1863); the Kremianets Lyceum in Volhynia (1819–32); and the Kyiv Institute for Daughters of the Nobility. In the middle of the 19th century the first private schools of art appeared in Ukraine. In Kyiv N. Buialsky’s Public School of Painting existed in 1848–63. In Odesa the Society for the Promotion of the Fine Arts sponsored the School of Painting (1865–99; see Odesa Art School). In Kharkiv Mariia Raievska-Ivanova’s School of Drawing was in operation in 1869–96 and in 1912 (see Kharkiv Painting School). Mykola I. Murashko’s Kyiv Drawing School was founded in 1875 and existed until 1901. The last three schools mentioned were of an academic character, and at the beginning of the 20th century they were transformed into art schools under the direction of the Saint Petersburg Academy of Arts. Their graduates attained a level of education above the secondary level and had the right to enter the Academy of Arts. In the 19th century and the beginning of the 20th century the first schools of industrial art were established in Ukraine. The best known among the schools in central and eastern Ukraine before 1914 were the Mezhyhiria School (1826–74, part of the Mezhyhiria Faience Factory); the Nikolai Gogol School in Myrhorod (established in 1896 and directed by Opanas Slastion); the school in Kamianets-Podilskyi (founded by Viacheslav Rozvadovsky in 1905); and the Opishnia School in the Poltava region. The schools of industrial art were funded by zemstvos or by private individuals. Most of the schools of kilim weaving depended on private support: the school in the village of Dihtiari (founded in 1898); the schools in Skoptsi and Reshetylivka (both directed by Ye. Prybylska in 1910–16); the school in Shylovychi; the school in the village of Olenivka in the Kyiv region (supported by Varvara Khanenko, directed by Fedir Krychevsky); etc. In Galicia there was a secondary school of industrial art in Lviv that was established in 1890 and several lower schools: of wood carving and kilim weaving in Kosiv, of woodworking in Yavoriv, of pottery in Kolomyia, of ceramics in Lviv. Some schools were associated with factories: the kilim factories in Tovste (school founded by V. Fedorovych in 1887), in Hlyniany (1894), and in the village of Zoziv (school founded by H. Levkovych in 1905). In Transcarpathia there was a ceramics school in Khust. In 1903–18 the Kyiv Graphic Arts and Printing School was associated with Vasyl Kulzhenko’s printing press. To obtain an advanced art education, Ukrainians had to attend foreign academies, and went primarily to the Saint Petersburg Academy of Arts (est 1757), which was the sole academy in Eastern Europe. Among its graduates were such artists as Antin Losenko, Dmytro H. Levytsky, Volodymyr Borovykovsky, and Taras Shevchenko. The Cracow Academy of Art (est in 1900) produced a group of impressionist landscape art painters: Oleksa Novakivsky, Ivan Trush, Mykola Burachek, etc. Mykhailo Boichuk and members of his group studied at the Paris Academy of Fine Arts in the 1910s. Others attended academies in Rome, Vienna, Munich (Matvii Drak, Vadym Meller), Berlin, and other places. Art-history chairs were set up at Kyiv University (Hryhorii Pavlutsky), Kharkiv University, Odesa University, and Lviv University. It was not until a Ukrainian government came to power that the Ukrainian State Academy of Arts was established by the law of 5 December 1917. Its first rector was Vasyl H. Krychevsky. The Kyiv Architectural Institute, under the direction of Dmytro Diachenko, was set up in 1918. A chair and a department of the history of Ukrainian art, headed by Oleksii Novytsky, were established at the All- Ukrainian Academy of Sciences (VUAN). The Odesa Art School was turned into an institution of higher learning. In the Soviet period the Ukrainian State Academy of Arts became the Kyiv Institute of Plastic Arts in 1922–3 and a year later the Kyiv State Art Institute. In 1924, when the Kyiv Architectural Institute was abolished, a department of architecture was added to the Kyiv State Art Institute. During the 1920s and the early 1930s the three main art schools in Kyiv, Kharkiv, and Odesa were subject to frequent reorganization into industrial-art schools, an art-polytechnical school (Odesa), an art-professional school, an institute of proletarian artistic culture (Kyiv), or an art-technical school (Kharkiv). In 1928 they were finally designated art institutes of higher education and operated as such until 1934, when severe repression of Ukrainian culture began. The reforms of 1934, which were designed to adapt education to the needs of industry, demoted the Kharkiv and Odesa institutes to the secondary school level. Only one higher school of art—the Kyiv State Art Institute—was preserved. The best industrial-art schools—in Kamianets-Podilskyi and Mezhyhiria—were closed. Education was placed under strict Communist Party control, and many art teachers suffered political persecution. In Western Ukraine, then under Poland, there were chairs of art at Lviv University and at the Greek Catholic Theological Academy (Volodymyr R. Zalozetsky-Sas and Ilarion Svientsitsky in 1928–44). 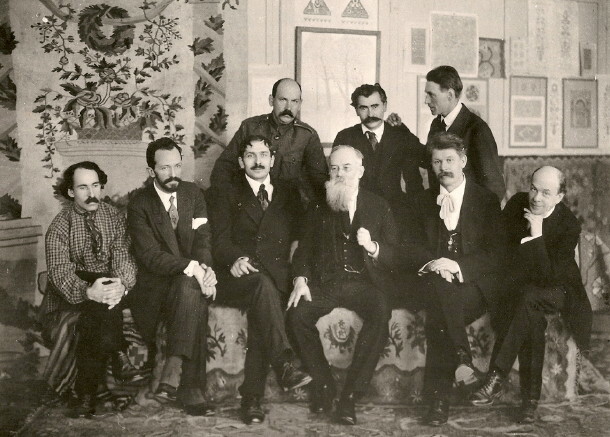 In 1923–32 there was also the Novakivsky Art School in Lviv, which was supported by Metropolitan Andrei Sheptytsky. The Studite Fathers operated a school of icon painting in Univ. During the German occupation the Higher Painting Studio directed by Vasyl H. Krychevsky was opened in Lviv. In the postwar Ukrainian SSR the only higher art school was the Kyiv State Art Institute, which contained the following faculties: painting (including workshops on stage design, pictorial and monumental art restoration), graphic art, sculpture, architecture, and art history and theory (which also had a correspondence courses division). A secondary industrial-art school, the Taras Shevchenko School, with an 11-year curriculum, came under the institute. There were two higher schools of industrial art: the Lviv Institute of Applied and Decorative Art and the Kharkiv Industrial Design Institute, which used to be the Kharkiv Art Institute. Each institute had two faculties: the Lviv Institute had a faculty of decorative-applied art and a faculty of interior and furniture design, while the Kharkiv Industrial Design Institute had a faculty of industrial art and a faculty of interior and furniture design. Each had a five-year curriculum. A chair of art existed only at the Kyiv State Art Institute. Soviet Ukraine had no academy of arts; such an academy existed only in Russia. In 1947 the USSR Academy of Arts was established in Moscow. It was an institution of higher learning and graduated artists with the highest qualifications. Five Ukrainian art schools at a secondary level with a five-year curriculum admitted students who had not yet graduated from high school; these were located in Dnipropetrovsk, Luhansk, Odesa, Simferopol, and Kharkiv. There were also four secondary schools of applied art in Vyzhnytsia, Kosiv, Lviv (the Ivan Trush School), and Uzhhorod, and an industrial-art high school in Kyiv. These schools prepared specialists of an intermediate level, among whom were secondary school teachers of painting and drawing. Qualified workers in the applied or decorative arts were trained at technical-art schools, which had a three-year program. Secondary school students with exceptional artistic talent could (from the 1950s) attend supplementary four-year art schools. There is a wide network of voluntary organizations for individuals, particularly young people, with artistic interests. Art instructors and consultants at palaces of culture, homes of culture, and amateur clubs promote art among the public. Outside Ukraine, in Prague, a higher school of art—the Ukrainian Studio of Plastic Arts—was directed by Dmytro Antonovych in 1923–44. Chairs in the history of Ukrainian art were held at the Ukrainian Free University by Antonovych and at the Ukrainian Higher Pedagogical Institute by Volodymyr Sichynsky. The sculptor Alexander Archipenko directed his own school in Berlin (1921–3) and then in various cities of the United States. Beginning in 1945 various art schools and studios were set up in the displaced persons camps in West Germany. 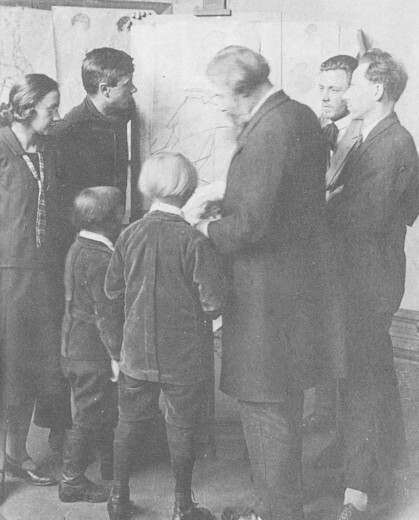 The main schools were in Karlsfeld and Berchtesgaden (Edvard Kozak, Serhii Lytvynenko, Mykola Anastaziievsky, M. Hotsii, et al). In the 1950s several art schools were established by Ukrainian artists in the United States and Canada, including the Ukrainian Art Studio in Philadelphia (directed by Petro Mehyk since 1952), Myroslav Radysh’s school and Liubomyr Kuzma’s school in New York, Petro Sydorenko’s school in Toronto, and Kateryna Antonovych’s school in Winnipeg.